Titleist is introducing a new line of Scotty Cameron Futura putters available in Australasian golf shops beginning March 17. The Futura family of putters offers seven high performance mallet-style models that provide golfers at every level of the game with stable, forgiving putter setups. From rounded mid-mallets to high-tech, high-MOI larger mallets, the 2017 Futura family melds the best design characteristics of the previous generation GOLO and Futura X lines with Scotty Cameron’s continued innovation in multi-material putter constructions. Multi-material technology – featuring wrap-around face-sole constructions milled from lightweight 6061 aircraft grade aluminium, integrated with precision-milled 303 stainless steel – moves weight back and to the perimeter, allowing for larger putter heads with enhanced High-MOI performance (resistance to twisting during the stroke). These multi-material, high-MOI designs combine with Scotty’s tour-proven heel-and-toe sole weighting technology to increase stability and forgiveness. Enhanced alignment options – including milled topline sight lines, dual-purpose alignment (5W, 5S, 6M, 7M), new pop-through visual cues, rail alignment features and bright lines framing the sweet spot – provide added confidence at address. “This new Futura line blends my ideas about high-performance putter designs with my longstanding ideals that high-tech should always be high-quality,” said Cameron. The new Futura models are identified by shape and size using a 5, 6 and 7 numbering system. Higher numbers indicate larger sizes. Futura 5CB and Futura 5MB are elegant, rounded mid-mallets that blend Scotty’s decades long design aesthetic that a putter “should melt into the ground” with multi-material face-sole technology. Futura 5CB (“cavity back”) features a pop-through black anodised 6061 aircraft aluminium flange plate and single milled sight line on the topline. Futura 5MB (“muscle back”) features a refined, rounded 303 stainless steel back flange with a Silver Mist finish and a single milled sight line. Futura 5W and Futura 5S improve upon the popular aspects of the prior generation Futura X5 and Futura X7M models. The Futura 5W (“W” for “wing”) is shaped similarly to the Futura X5, but now has full wrap-around multi-material face-sole technology and enhanced dual purpose alignment features that frame the ball and aligns the sweet spot with white flange lines placed parallel to each wing. Futura 5S (“S” for “straight shaft”) is a more compact and stylistically updated version of Futura X7M with a straight shaft setup inspired by tour feedback, and dual-purpose alignment. Inspired by Scotty’s work with Adam Scott, the Futura 6M (“M” for “MOI”) introduces the best MOI-enhancing traits of the original Futura X model in conjunction with design cues expressed in the Futura X7M, combining a pop-through “bar back” design with deep heel-toe weights for the ultimate in forgiveness and resistance to twisting at impact. A new Futura 6M Dual Balance model is also available for those players who need maximum stability in their stroke. Like all Dual Balance models, the Futura 6M DB has a 50-gram heavier head and a 50-gram counterweight in the grip end of the shaft. The Futura 7M improves upon the Futura X7M with refined shaping of the back wings, including the stainless steel “bar back” that moves weight behind the putter face for added forgiveness, along with dual-purpose alignment. Left-Handed options will be available in the Futura 5CB and Futura 6M models. 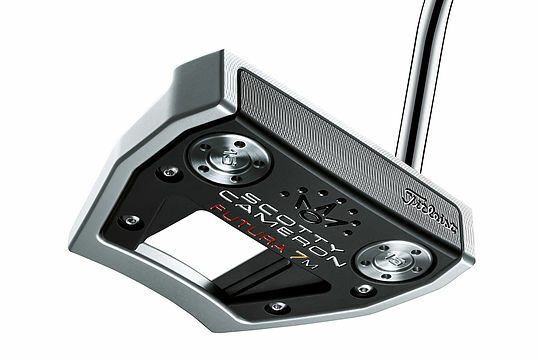 Each new Futura putter features advanced stability weighting with two removable, customisable stainless steel sole weights, stepless steel shafts and supple Black Matador Mid-size grips with red and gold accents (Futura 6M DB employs a 15-inch Dual Balance grip) developed to offer the comfort of a larger grip while maintaining responsiveness and feel. The new Futura putters will be available on March 17 in Australian and New Zealand golf shops beginning with a suggested retail price of $569.